Order in 2 Hours 57 minutes 50 seconds for dispatch today! Constructed using GRANITE fabric; a highly abrasion resistant nylon double weave with Spandex for a four way stretch for enhanced mobility and a cotton-like feel. CORDURA® Hydro reinforcements on the knees, seat and instep make these pants ideal for all conditions on the mountain face. Throw in triple stitched seams and a multitude of handily placed pockets and you've got the reliability and durability that the Terra's reputation was built upon - but taken to the next level! Wore them for the first time today in -2C and 70km/h winds on Djouce. I had Patagonia Capilene Thermal Weight Bottoms under them and felt great and had the vents open for the entire walk and i was still nice and toasty. I was sweating a bit on the way up but dried up very quickly once on the top. I could see my combo easily go to -15C without any issues. Great pants! 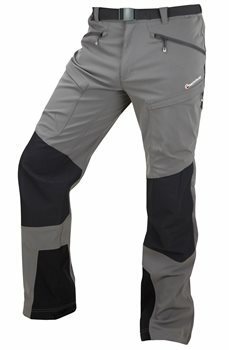 These pants are the best yet in the Montane series, well made great fitting, durable,and excellent value for money. Jacksons ordering process was simple and they followed up with the order, even to the overseas delivery address FANTASTIC customer service. These are great trousers, very comfortable and durable. Great fit! I'm about 33 inches in waist and 181cm in height, Large size fits me perfectly.